This series of installations are poetic visualizations of a personal database, consisting of every word written in the author’s computers for a four year period (2002-2006). 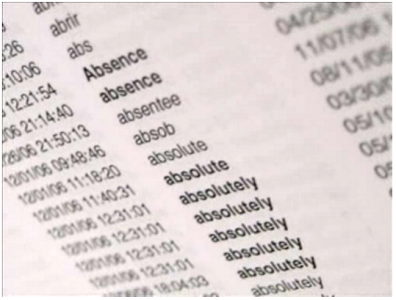 The database contains metadata, such as time-stamps for each word, capitalization, and its source. This allowed Mendoza to create software installations that lead us to pay attention to the language in through various conceptual lenses. 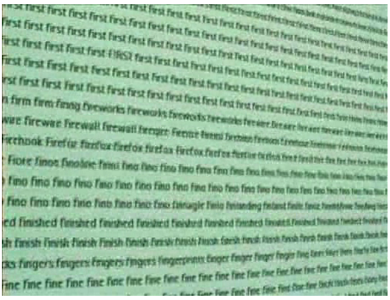 “Every Word I saved” (pictured above) recontextualizes the language in the dataset by displaying it in alphabetical order as a stream of text flowing in the screen, suggesting a radically reorganized stream of consciousness. The words are stripped of all data, except for their capitalization, a minimal touch that provides significant variation from the steady stream of repetitions of the same words. The kinetic presentation of streaming text allows us to perceive these meaningful graphical cues as they crest like waves over the steady linearity of lower case letters. The book version, published in 2007, appropriately uses formatting that developed in the print world to create visual variation in the lists of words that indicates their provenance: documents, e-mail messages, or instant-message logs. This, along with the time-stamp information reminds us of the digitality that underscores this project and remind us that a book has a way of collapsing an entire composition process into a single time stamp: its publication date. The uttered version uses text-to-speech software to read each word aloud, gathering speed as a word is repeated until it accelerates beyond the word into music. 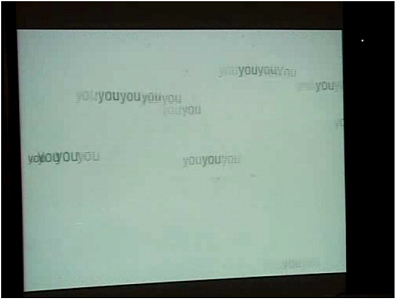 Mendoza cleverly used time-stamp information to inform variations in pitch and visual arrangement to make the piece more engaging as well as indicating the different contexts in which the same words were used. This trilogy of conceptual poems remind us of how so much of our language production happens through computers and how that could be read in such different ways. As distant reading techniques and data visualization develop as digital humanities research methods for literary and other linguistic data sources, it is significant to see similar techniques explored at an artistic and poetic level with a very personal data set. This series is one of those cases in which digital humanities methods and electronic literature converge to produce aesthetically pleasing and conceptually engaging results.